A few thoughts if you’re scheduled to take tomorrow’s SAT. SUGGESTED: These are things you may want to bring along. Make sure your financial aid documents complete. If you’ve completed and submitted your FAFSA, you should have received your Student Aid Report (SAR). Look it over for accuracy and respond to any requests for any additional information as soon as possible. If you’ve finished the CSS/Profile and any state applications respond to any requests for additional information in your inbox. If you haven’t worked on these forms yet, submit them as soon as possible as some aid is handed out on a first come first serve basis, so don’t wait too long. Research scholarship opportunities. There are so many resources available to search for scholarships. Scholarship deadlines vary throughout the year so continue to search and apply. There may be money out there to help fund your college education. Focus on your schoolwork. Colleges may still request your grades so keep up the good work. Your admission and financial aid offers are contingent on maintaining your academic standing. Check your inbox regularly. The schools you’ve already been admitted to may be reaching out to let you know about special programs and events for accepted students. Investigate any links and opportunities they send you. If you applied for any scholarships, be on the look out for responses. You may also receive requests for additional information. Share important news to share with Admissions reps. Be mindful in sharing only significant and meaningful accomplishments that you feel supplement your application in a positive way. If you’ve received any special attention or recognition, you should reach out to let them know about it. For example, if you’ve won an award or contest or have had your work published, take pride and share your good news with your admissions rep. Athletic, artistic, and musical accomplishments should also be shared. Informing Admissions of your achievements could have a positive impact on your application. Consider if you’d like to apply to any additional schools. There’s still time to apply to schools with both rolling and late admissions deadlines as well as schools that have chosen to extend their deadlines. Check with your guidance counselor for a list of schools still accepting applications. JUNIORS, all the talk about standardized testing may be leaving you feeling overwhelmed. The best way to alleviate some of your stress is to develop a schedule. MEET WITH YOUR GUIDANCE COUNSELOR. He or she can help you get a better understanding of the tests and how they differ. CHOOSE WHICH TEST YOU’RE GOING TO TAKE. Take a practice SAT and ACT to see which test you’re more comfortable with and where you’re going to get the best score. Kaplan Test Prep offers free online events and tests to help you compare. The Princeton Review also offers free online tests. ESTABLISH A PLAN. If you can get either the ACT or SAT and SAT Subject Tests (SAT IIs) out of the way in junior year, you’ll have more time to focus on applications and financial aid next year. Know that you’ll have additional test dates during senior year should you need them. If you’re planning to take SAT IIs, take into consideration any AP or IB exams as well as your course finals when planning your schedule. This way, you can study for those exams and corresponding Subject Tests at the same time. Also keep in mind that while you can take up to three Subject Tests on any given test date, you can not register for the SAT and any Subject Test on the same date. The upcoming SAT test dates are May 4th and June 1st. So, if you’re planning to take SAT Subject Tests, choose the test date that best lines up with your AP, IB and/or final test schedule in order to free up the other test date for the SAT. LET YOUR PARENTS AND GUIDANCE COUNSELOR HELP. Think about your commitments, choose test dates that don’t conflict with any of your own personal obligations and talk to your parents to clear the test dates you are considering with the family calendar as well. SIGN UP FOR TESTS. Sign up as soon as possible to ensure your spot at the location of your choice. Keep a master calendar of the tests, test dates and locations that you register for and store your registration ticket in a place you’ll remember on test morning. PREPARE. Find a prep resource that will best fit with your learning style and also your budget. There are many free resources available. You can also purchases prep books online and in your local bookstore. Use these resources to take practice exams— this is the best way to get comfortable with the tests and develop your test taking strategy. In addition, there are many online prep programs as well as classes in your local area. Ask your guidance counselor for recommendations. Plan to take as many timed practice tests as possible to develop a good sense of how to pace yourself. KEEP TRACK OF YOUR SCORES. 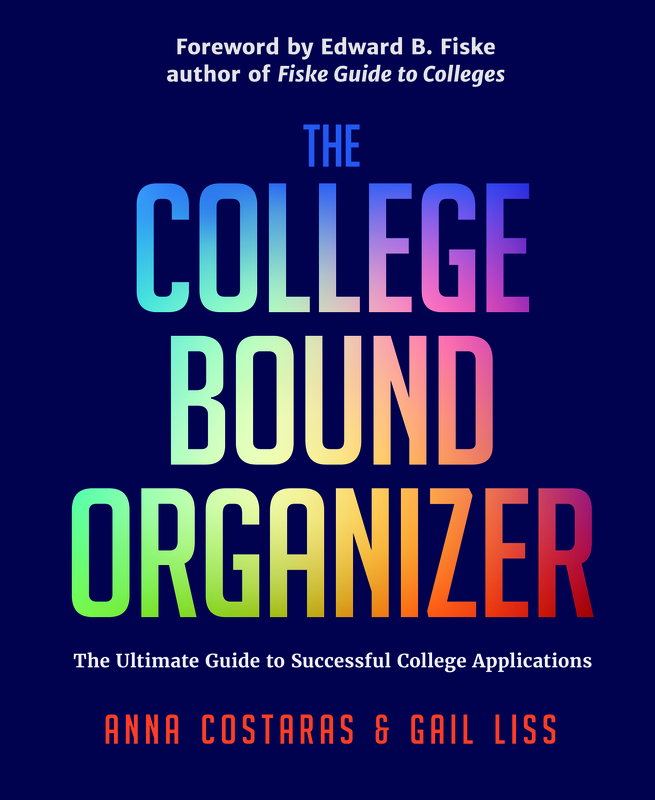 Once you have your results, record all your test scores on a master calendar like the one included in The College Bound Organizer. From this list you’ll choose your top scores, even if those scores are from different test dates, to submit with your applications. CONSIDER TEST-OPTIONAL SCHOOLS. Whether you decide in advance to opt out of standardized test taking or if you’re not happy with your scores, test optional schools may be a good choice for you. There are more than 1000 colleges and universities that don’t use the ACT or SAT in their admissions process. Remember your test scores are only one piece of your application. Admissions officers are interested in more than test scores. They’ll also be looking at your grades, your curriculum, your participation in extracurriculars, and what you express about yourself in your essay. “Demonstrated interest” is a term often used in college admissions, referring to serious an applicant is in attending a particular school. There are many ways a student can demonstrated that he or she is interested in attending. Traditionally, interest has been demonstrated by visiting a campus and signing up to participate in an info session and campus tour, making the effort to meet a rep at a college fair or a high school visit, as well as writing thank you notes after interviews and meetings. More recently, colleges are gauging students’ interest in surprising new ways. Using new technology schools are tracking how promptly students are opening emails, signing up for interviews, how long they’re spending on school websites and even at what point in high school they began looking on their site. Although not as important as grades and test scores, demonstrated interest is still a factor in the admissions process at many schools. Make an initial list of schools to visit. Reach out to your guidance counselor for help. Review the admissions sections of school websites for info session and campus tour schedules and reserve your spot, if required. If you’d like to meet with a faculty member or a coach reach out in advance to make an appointment. Coordinate your meeting with the tour and info session schedules. Leave some extra time to explore the campus. You can eat in the cafeteria, visit the student center, even sit in on a class (ask Admissions how to arrange). Look around and notice what students are doing. If you can, take the time to explore the surrounding neighborhood and town. Throughout the day, take notes and photos to help you remember details. If there’s someone you want to follow up with, ask for their contact info. Use an envelope to collect and save business cards from school reps you meet. Remember to send thank you notes and follow up if you’ve been asked to provide additional information. Does the school provide housing for all four years? If yes, do most students stay on campus? If no, how hard is it to find off campus housing? What portion of the students join sororities and fraternities? Do students feel pressured to join Greek life? What’s the process like? What clubs and extracurriculars are offered? What’s your favorite thing about the school? What, if anything, has disappointed you? How available are professors for extra help? Are you assigned a freshman advisor? Is there a supportive advisory system? Where do most students study? How much time do you spend on school work each day? Do students stay on campus for the weekends? What do you do for fun? Do students get involved in the surrounding community? What do you like best (and least) about the school? What percentage of classes are taught by professors versus teaching assistants? Is study abroad encouraged? What percent of students participate? What is the total cost of attending? What percentage of students receive the aid they require? What career service support is offered for summer and full-time opportunities? What jobs are available on campus for students who want to work part-time?